PARTUS: KOTAMOBAGU FULL DAY SCHOOL, "CAN,T"
Home » POLICY » KOTAMOBAGU FULL DAY SCHOOL, "CAN,T"
KOTAMOBAGU FULL DAY SCHOOL, "CAN,T"
In recent days the Indonesian education fuss about rogram full day school was initiated by the new Minister of Education Mr. Muhajir Efendy. I was so noisily, to the extent that there are among the artists have to jump over the fence of his profession and suddenly become observers of educational problems. Any government officials in the area such as the Vice Governor of West replied, Puwakarta Regent, Regent and Mayor Bolaang South Mongondow Kotamobagu must speak reject discourse initiated by the education ministry. Apart from the black and white comments that developed it, I applaud what initiated new Minister of Education. At least this was evidence that despite the new beginning sworn he was already ready to launch educational programs Indonesia terrific. What exactly is wrong on this full day school program? This supposedly said other forms of exploitation of children and teachers that do not make any difference to a robot. If in thinking to achieve great vision of Indonesia president Jokowi then it should need programs like this great work, exclusive, unusual, and the other from the other. Is not it also the president Jokowi nawacita already placed in plain view character education program of basic education. This means that the government would study the nature of that applied to students ranging from elementary, junior high school is learning patterns that build positive habits in order to form its own characteristics in the child's self. The trail can be done with this full day school program. Regardless of the intent of this program, there are guessing at will-like the hearts of some people say go to school until almost night program will make students and teachers stress, what yes?. Lucky as far as I know there has been no claim of students and teachers affected by the tsunami gurumi because school until dusk. In fact in amaliyyah Shafiyyatul Education Foundation (YPSA) field as one of the schools which had imposed full day school, the teacher and his pupil nothing suggestive of stress especially crazy. National Commission for Child Protection also chimed somersault by saying not to replace the full-day program of education of parents to their children. Several heads of regions in Indonesia prefer more gentle reasons: culture of the region is not ready to accept, school infrastructure does not yet support. The concept of Full Day School told the Minister of Education on the site tempo.co.id a full day educational program at school where a second home for students. It is intended that the students will not get stuck on activities that are less brings benefits such as internet cafes to play games, a trip to the mall, and even a brawl between students of the school. Model learning activities of this program as a model learning still applicable today, but further intensified the use of additional hours for extracurricular activities after hours of learning over. In short according to the Ministry of Education there are three main reasons digagasnya this program, first, to help parents themselves when they are busy working from morning till evening, both no subjects, because of which used the remaining time is diverted for extracurricular activities. The third helps the teacher certification are required to have 24 hours of teaching each week. Related of three reasons that, in the rain of criticism and flooding denial of society as outlined in the petition, during a press conference at the restaurant Batik Kuring, Jakarta, August 9, 2016 and the minister said "it should be the public criticized this idea, not a decision I made then was not matches ". Oh great, here's an example of a leader is not anti-criticism and should be imitated who feels himself a leader. not the opposite, always felt on fire, the sky will fall if there are people who criticize any policy. 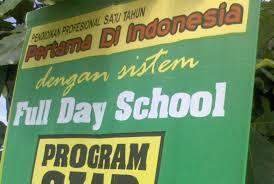 Readers, by observing all of the reasons the reasons that develop in the public ranging from the category of mediocre class artisan satay to the most cutting-edge of the forehead (scholar) then in my opinion the program full day school is appropriate to proceed, with notes done only purpose of the project study. The trick used to enforce a limited basis, to certain areas or certain schools. This will greatly assist the government in improving the program in case it is implemented. Unfortunately the same time passion of this program began to fade, the article of the Minister of Education in his delirium had planned to cancel the full day school program. If my memory does not slip, the same thing actually never been done before Education Minister M. Nuh by 2013 or K13 curriculum program. Exactly the same happens like today, reaping excessive reaction of society, with the worry that penetrate the wall impossible without intention to try first. But when trying to run, turned out to be successful. Interestingly, there was a funny incident in Kotamobagu which already carries the slogan "Kotamobagu can" during the celebration of the birthday 9th, actually being a pioneer leading support this program but instead beaten before the match with the statement join refused (read can not) program full day school as published in some online media (eg probmr.com). I had to fight hard to hold uric laughter suddenly tease from this incident but is said every problem that does not know the word compromise. I honestly, do not give a damn and questioned the reason for rejecting the mayor of full day school program, OK it's prerogative mayor indisputable anyone. But come on do not inkosisten mother Kotamobagu mayor memes can, as it will become more abundant laughter and asked a million and ruffled public confusion. Is this meme is only just a cute phrase to compete with services on the model city vision banners, billboards installed? or is this really a fighting spirit to strengthen the impression, motivation Kotamobagu Government work more above normal. Most probably (I insist) No winged commentary behind the word "can", can choose a, b can choose according to taste. Put the word allegation is true, then I choose to watch opera van java, Indonesia comedy club course it would be much more entertaining with fresh meme to simply exercising his mouth. In closing, I suddenly worried ancient adage celebrities Ibn Khaldun 600 years ago in his book Prolegomena Al'Ibar will prove in Kotamobagu. That power is the peak of human lust, because of that, happy man scramble and hope to have it in perpetuity. But unfortunately, not every human being capable of taking power that has fallen into his hands. Read Also " HOW TO COMPLETE LAND DISPUTE "